So here's a fun (and perhaps slightly unbelievable) fact about me and my travels: even though I've spent more than 7 months collectively traveling in Europe in the last three years, I always seemed to skip over Switzerland. Yes, I know about its gorgeous mountains and startling efficiency. But the price of travel in Switzerland always kept me away, especially when I could find mountains elsewhere in Europe for a much more budget-friendly price. So it wasn't until late 2015 that I finally set foot on Swiss soil. 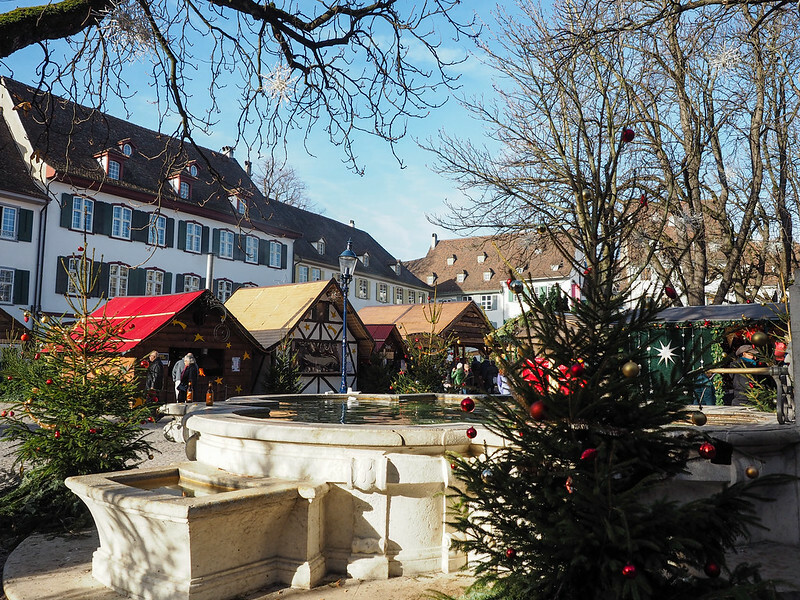 It was at the end of a Christmas market river cruise down the Rhine with Viking River Cruises. The cruise ended in Basel, a Swiss city close to the borders of both France and Germany, and I figured why not stick around and explore a bit? If you're saying to yourself right now, “I don't know a thing about Basel,” don't worry – I said the same thing. You don't hear many travel bloggers singing the praises of Switzerland's third-largest city. Probably because it lacks those pretty mountain views. But also probably because… well, Basel is kind of boring. There are lots of museums in Basel. A historical cathedral. And lots of high-end shopping. But for someone who isn't really into art museums and who can barely even afford to look into the window of a store like Hermes, there was little about the city to make me excited. And then add in $30 pizzas and $25 salads, and it was almost enough for me to write Basel off entirely. But, I'm the type of person who tries to find the positive in every thing (and every place). I don't write destinations off lightly. So I'll admit that there was one redeeming quality of Basel: The Christmas markets! 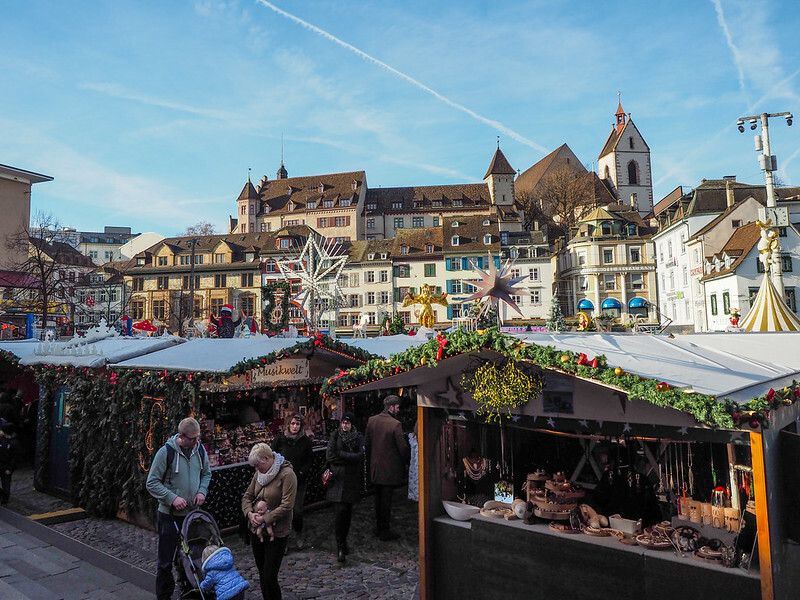 In my opinion, the best time to visit Basel is around the holidays. At this time of year, nearly every city in Europe decks itself out in its Christmas finest, with flocked Christmas trees and twinkle lights making everything extra festive. Basel is no exception. 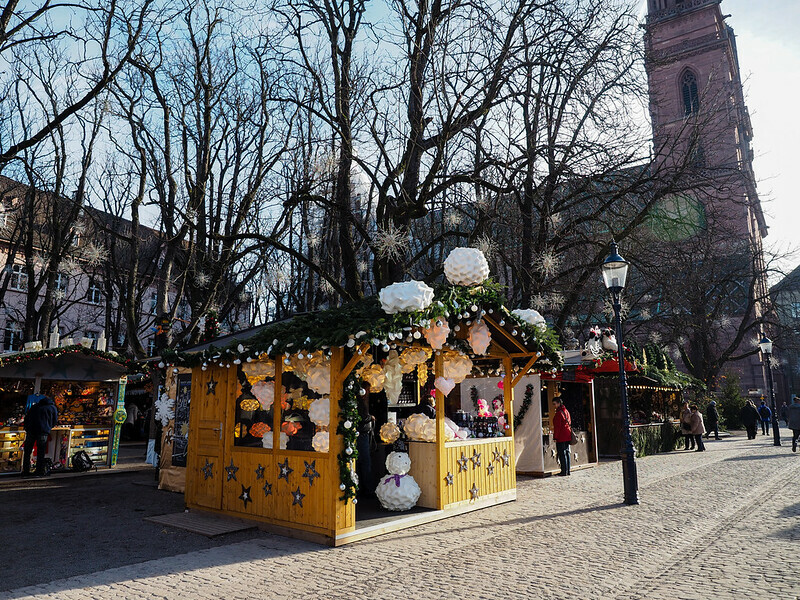 Basel is also close to the border of Germany and the Alsace region of France, both of which are known for their fantastic Christmas market traditions. 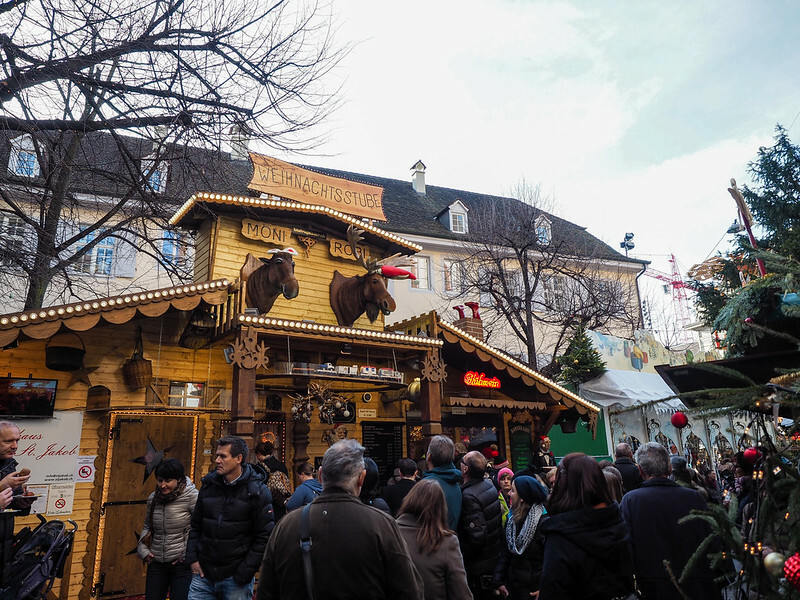 Hence, perhaps, why Basel is home to the largest Christmas market in Switzerland. 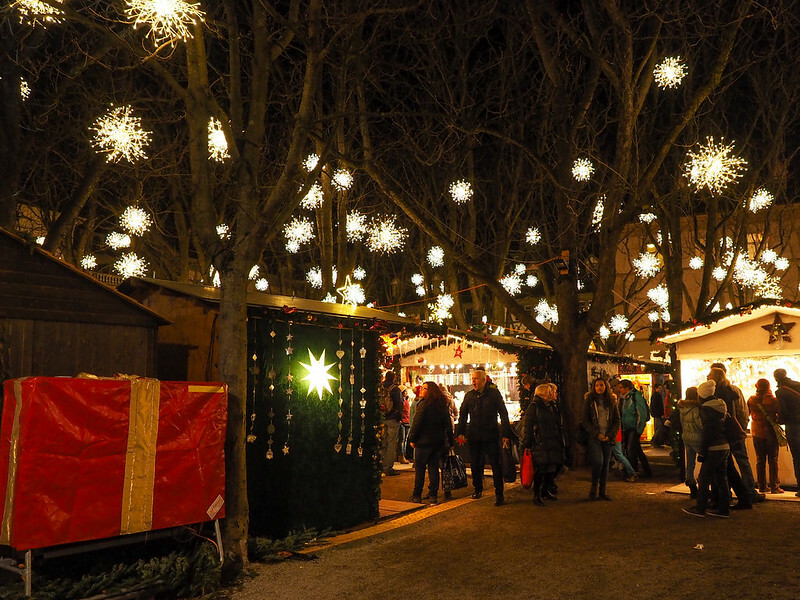 Basel actually has a couple of Christmas markets. The largest is at Barfüsserplatz, where hundreds of stalls sell everything from art to bratwurst to jewelry to gluhwein. I was actually taken aback by the size of this market – it's HUGE and was packed no matter what time of day I went. That's another thing that struck me about the markets in Basel – they're definitely not just geared towards tourists. 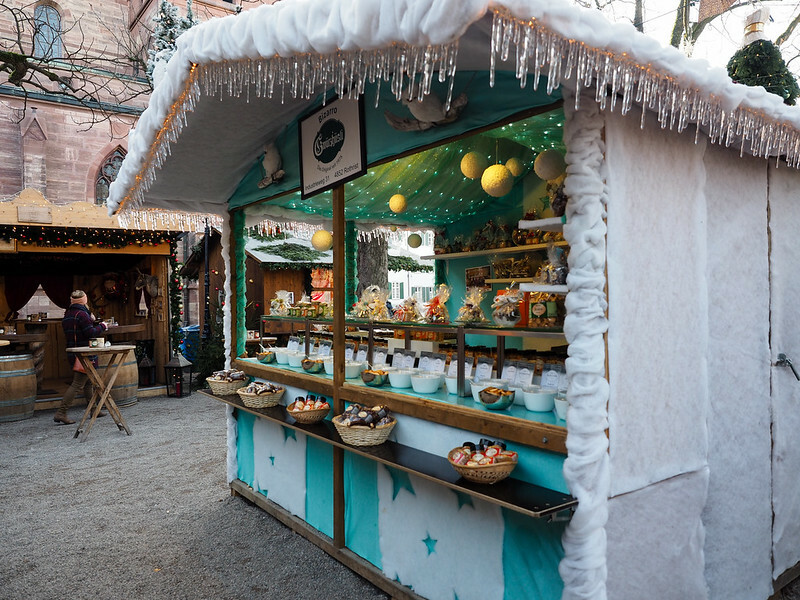 They easily could be, being the largest market collection in the country, and with Basel being a starting/ending point for Christmas market cruises along the Rhine. But you're much more likely to find families, groups of friends, and locals from surrounding cities gathered at the markets here to shop and grab a bite to eat than foreign tourists. The second-largest market in Basel can be found on Münsterplatz at the foot of the city's cathedral. This was actually my favorite market because it was set in a small “forest” and lit up with snowflake-shaped twinkle lights. I actually went back to this one more than once, to see it both during the day and at night. The Christmas markets saved Basel for me. I stayed at the Radisson Blu in Basel, which is located on Steinentorstrasse. 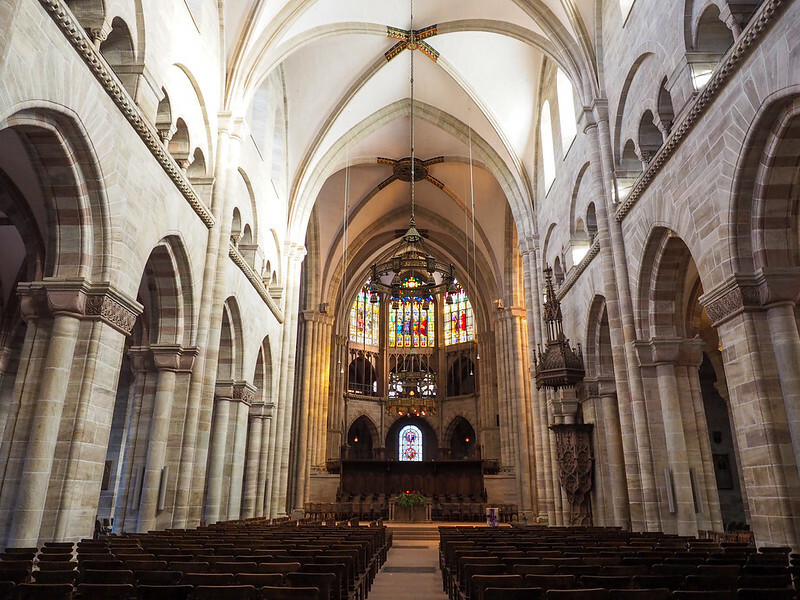 This ended up being ideal – there's a tram stop right outside the hotel, it's one street over from one of the main shopping/dining streets in Basel, and it's an easy 10-15 minute walk to everything from the cathedral to Basel's very striking Town Hall. The hotel is very modern with large rooms, comfortable beds, and a funky lobby. The hotel has a restaurant, offers free wifi, and some rooms even have Nespresso machines (nope, can't possibly get any more Swiss than that!). They also give all guests a free transportation pass for Basel's tram and bus system at check-in. I didn't end up using my pass since the Christmas markets (and everything else) were so close, but it's a very nice extra touch. 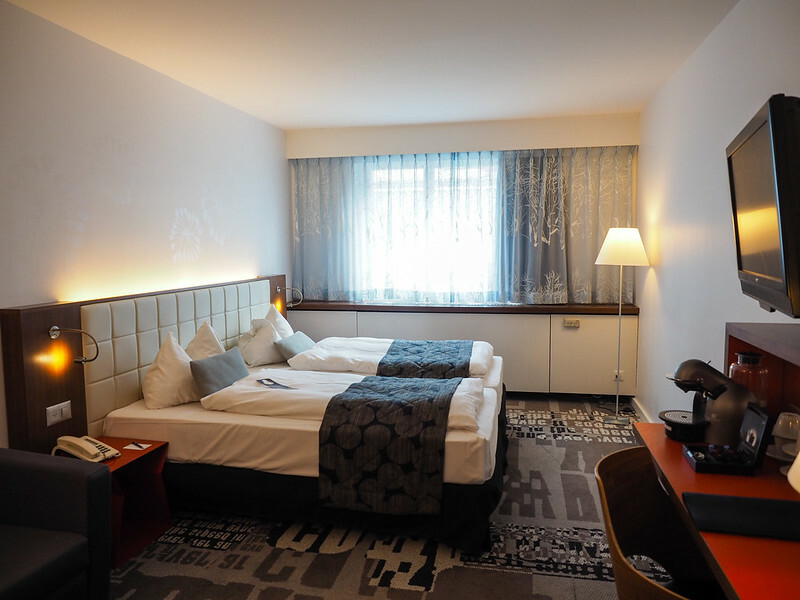 If you're in Basel before or after a Rhine river cruise, some of the cruise lines (like Viking) use this hotel for their guests, too, which should give you an idea of the quality and service you can expect. Would I have enjoyed Basel more if I was a museum person? Maybe – there certainly are enough art museums in the city. 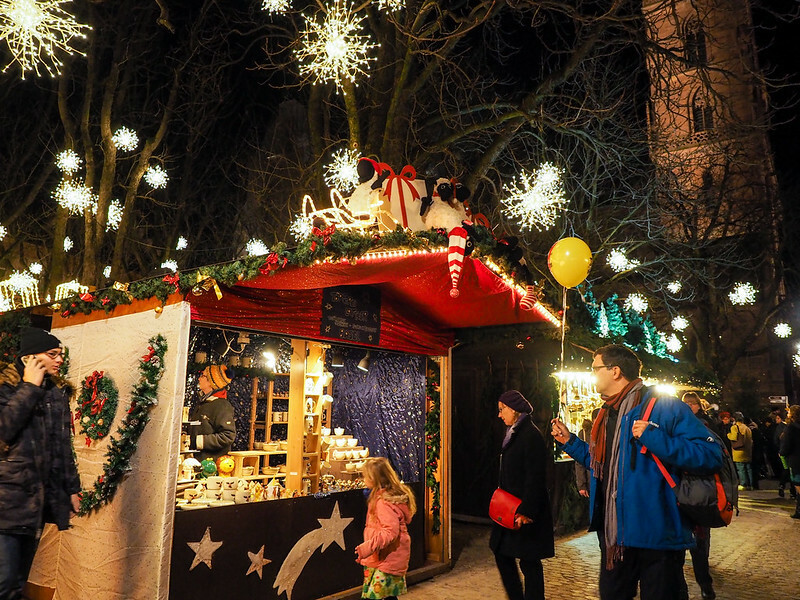 But, in my opinion, it's hard to beat the festive atmosphere you'll find at the Christmas markets – and hard to beat the prices of the market food and drinks! 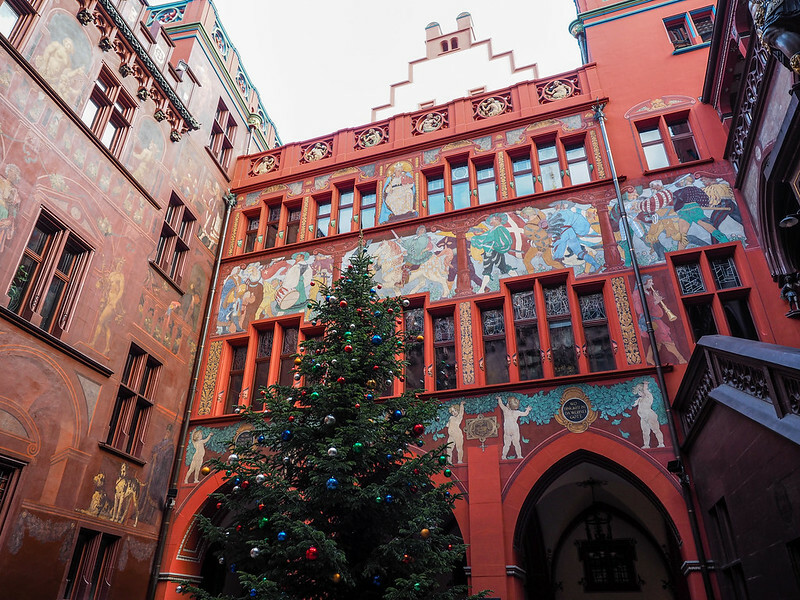 So, if you're asking me, I would definitely say that December is the best time of year to visit Basel. 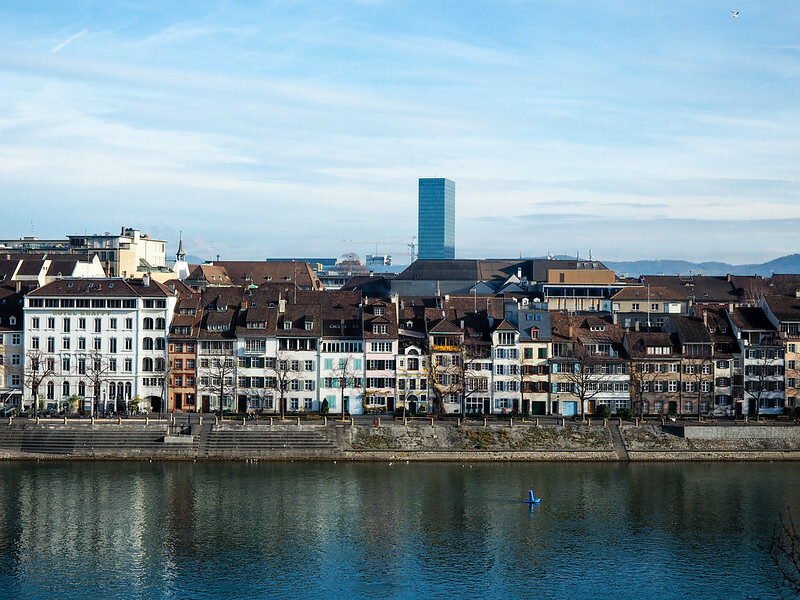 Have you ever been to Basel? My favorite time of year to visit Europe (and the only time of year I’ve ever been) is Christmas. I love the markets and seeing all of the decorations! This was my first time being in Europe around Christmas, and I loved it so much! I had a friend who studied abroad in Switzerland for a year and she too couldn’t believe how expensive it was. The Christmas markets look so adorable though! I’m determined to get myself to a European Christmas market of some sort in the near future. Was this year your first time going to one? Yup, first time visiting Christmas markets – loved it!! I think the ones in Germany were my favorite. And yeah, Switzerland is SO expensive! I had a salad for dinner one night that cost $25!!! I went to Basel last October. I was there for 4 days but part of that was to visit a client and practise my German (I’m a translator) so I spent quite a lot of time watching German films at the cinema and shopping for books 🙂 My client advised me to go during the autumn fair (the “Herbstmesse”), which is pretty similar to the Christmas market and also spread around the city. Without that I might have struggled to fill the whole 4 days! Yeah, I think going around a specific (and city-wide) event is probably the way to go! I think it looks beautiful! It may not be the stereotypical Switzerland that everyone thinks of, but I love that you found and suggested a unique reason to visit here. Who doesn’t love Christmas charm? Christmas charm definitely goes a long way! Lovey post about Switzerland Amanda! Sadly, I haven’t yet been to Basel or Switzerland even though I live in Germany and I do like art and museums lol! I keep trying to gather a weekend but because its in my local region I keep travelling further afar and putting it off instead with the old “I’ll-get-to-it-soon” ringing in my ear and then of course, some other location crops up and then it’s summer and time to go to the beach lol! Haha, I definitely understand! It’s so easy to put off traveling to the places in our own backyards – I’m guilty of it, too! I agree! Makes me wonder why more countries haven’t adopted the Christmas market tradition! I’ve been to many Swiss cities but not to Basel. And I feel I won’t like it so I simply don’t bother with it. And you just confirmed my suspicions! On the other hand – I didn’t expect to like Geneva and really enjoyed it, even in the rain! Yeah. I mean, if you were in the area, I suppose it wouldn’t hurt to stop by. But it’s not my kind of city; it just didn’t have any character. It’s a perfectly nice city – just not my kind of place! I’m glad you found a positive site of Basel, Amanda. The Christmas markets look beautiful on your pictures. They definitely were pretty – and much bigger than I expected, too! I am definitely an art and museum person. Can’t get enough of them! 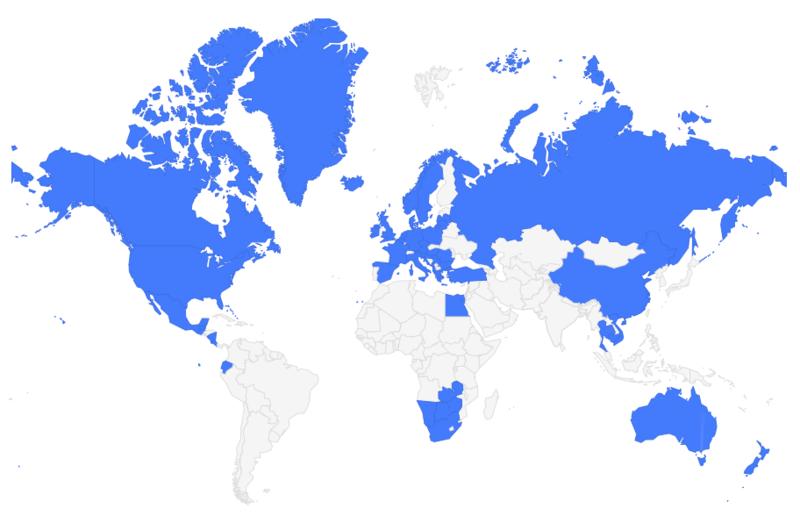 It’s funny how few travel bloggers seem to be! Haha! I guess we just don’t have the attention span for them! 😉 I like some museums – but art definitely isn’t my thing! Heh, yeah, it’s SO expensive! Especially considering that the Euro has dropped considerably recently, staying in Switzerland for a day was a big shock! There is one other (better?) time to visit Basel, that is Fasnacht. Basically the German/Swiss version of Carnival. It happens in late February or early March in cities along the Rhein River. Fasnacht is basically a parade of people with crazy masks and outlandish floats. Basel happens to have one of the biggest celebrations. One might even say rowdy, by Swiss standards. Good to know! That sounds like fun, too. Haha! I mean, I didn’t fall in love with Basel, but Christmas markets almost always make a city magical!